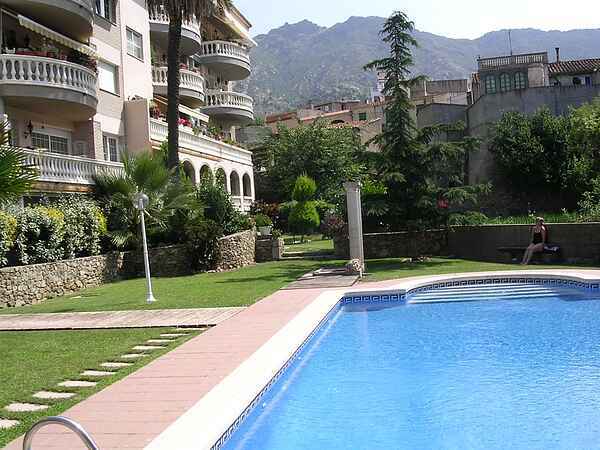 Lovely 3 bedroom apartment with two terraces, garden and direct access to the communal swimming pool. Equipped and fully furnished to a very high standard. Suitable for families or couples. Situated in the beautiful village of Palau Saverdera with all its local amenities within walking distance. The area is surrounded by mountains, olive groves and the national parK of Aiguamolls del Emporda which can been seen from the communal roof terrace along with the bay of Roses [sea} from both terraces. The village offers a small supermarket, butchers, bakers, pharmacy bank and several surperb restaurants. The area has something for everyone including the Aqua Brava water park, go-karting, fishing, boat trips, scenic land train rides, butterfly park, horse riding, windsurfing, Sky diving, golf and mini golf. Explore the Salvador Dali Museum in Figueres and the many historic villages in the surrounding area. The Castell de Peralada hosts an International Musical Festival in July and August with world class performances of opera, ballet, concerts and musicals etc. Peralada is 15 minutes drive away, it also has a championship golf course. The TGV fast train to Barcelona is now in operation and takes 53 minutes from Figures. France can be reached by car in 50 minutes. Arrangements can be made to supply a travel cot and high chair if needed. There is a small charge of 75 euros for bedding/linen,towels and cleaning.